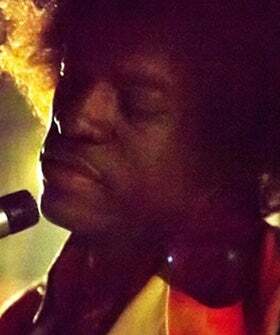 Thanks to a set leak, we officially have the first images of André 3000 as the legendary Jimi Hendrix. The actor/singer stars in the new film All Is By My Side, a biopic that focuses on Hendrix's early years before he made it big. And, in our humble opinion, the resemblance is absolutely uncanny. Not only will André 3000 put his acting chops to work for the flick, but he recorded the entire soundtrack — made up of covers of Hendrix's original music. While he was no doubt cast for his physical resemblance and awe-inspiring musical talents, he also feels a close musical connection to the singer. "In researching him, I saw that a lot of the paths that he went down where the same ones that I went down when I was a young kid," said André. "He did what he thought was right for his music. I always gravitated towards him. This movie is the real sh*t right here. I think people will learn things they didn't know."